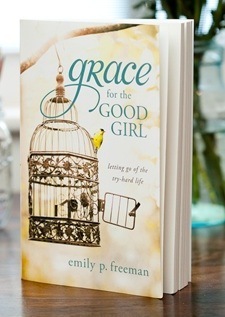 Grace for the Good Girl: Which Voice? I don’t know about you, but this sure hit home for me! For almost a quarter of a century, my husband has wondered why I purposely rehearse painful conversations in my mind, re-evoking old emotions. I don’t do it on purpose. It’s just that as a woman, so often what I hear I take to heart. If there’s anything a “good girl” fears, it’s punishment…the ultimate “proof” that she’s messed up and, thus, is no longer good. But when I live to avoid punishment, I live out of fear, not love. A few months ago, I started pondering this question: Why do I keep trying so hard to do what God’s already done? Do I really think I can do more than what Christ already did on the cross? To hear, instead, the words of God. And take Him–and His love–to heart. So glad to have found this site! So much better is the day if we start it off with the Lord instead of trying to do it on our own! I’m so happy you’re blogging through this book. I need to get into it! Do you have a schedule of reading for it? Oh my. The Lord is talking to me today. Last night I heard a song by Jason Gray on loving instead of fearing and I wanted to turn it off because I just couldn’t see how it was possible. I play those tapes over and over in my head all the time. Thank you for the helpful honest post! Grace is what I am studying and God keeps putting on my heart. This would be a great book to read!